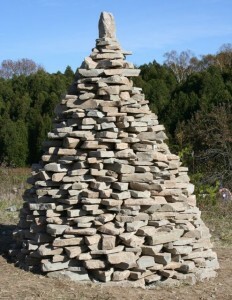 Conical stack of dolomite slabs put together by the 2010 meeting attendees of the North American Dry Stone Walling Association. Hope, Ontario. This class includes clusters of stone of any shape that do not qualify as lines or walls because they are either not elongated enough (4:1 ratio) or not tall enough (stones are either stacked or, if abutting, knee-high). The most common families of this class are piles used to dispose of waste stone, surfaces in which stone is used to protect the surface, and stone monuments to mark something culturally significant. This family of stone concentrations are defined by being only one stone thick. There are two basic types. The walkway, a stone surface, is flanked by monuments, which are classified as uprights. Jamestown, RI. The diagnostic criteria is that they are on flat or nearly flat ground, placed there to improve the surface for human activities (drainage, leveling, hardness, smoothness, etc.) Most common is the tiled pavement (informal subtype), in which the stones are placed flat-side up, to form a usable surface such as a floor when inside, a patio when outside, or walkways, driveways, and corridors. 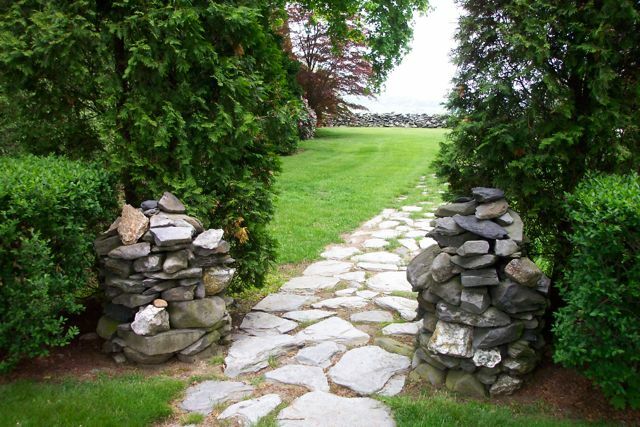 Also included in this group are cobblestone pavements (cobble for short), which are human mimics of natural forms that geologists call lag horizons, places where the finer materials was washed or swept away. For example, the base of most New England streams and beaches are cobbles. The corners of most pastures are cobbles produced where the extra stomping and grazing of livestock accelerated surface erosion. Stone veneer (Type) is a type of stone surface (Family) used to stabilize a highway cut on unstable soil. I forget where. In contrast, slope veneers are inclined. They are similar to pavements, except for their inclination, and similar to armoring walls, though they are only one stone thick, and therefore do not qualify as walls. The placement of tile, stone, or even a single layer of rubble stone on a sloping surface is a common way of protecting it from erosion, something that is especially common in drains along roadsides. Some stream embankments and sea walls fall into this specialized, and somewhat unimportant type of stone concentration. This family of the class “stone concentration” consists of objects of any size and height that meet the height requirement of walls (stacked stones or knee-high), but fail the elongation criterion. This group is much more complex than stone surfaces because most forms are three-dimensional, rather than two-dimensional, and most involve architectural choices. And all must meet the “stacked” degree of order. A simple stone monument (Type) is one type of stone upright (Family) which is one type of stone concentration (Class). Probably most common type of uprights are stone monuments. They vary in sophistication, ranging from tall and elaborate cylindrical columns with turreted towers, to simple stacks of stone on a rock slab placed there to help clear a field. 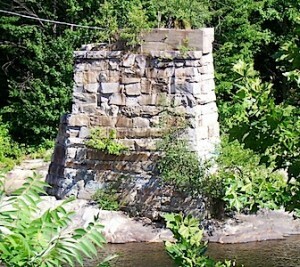 Subtype: Stack – The most primitive subtype of monument is little more than a simple stack of stones of any height. Such stacks are one-grade above the level of pile, in which the stones are dumped or tossed, rather than deliberately stacked. Subtype: Monument – The next level up in terms or order are monuments. These represent more than a simple vertical stack. Normally, they require the laid degree of order, with courses placed one above another beginning most commonly with a circle or a square of stones. There are many variants that grade into one another. Simple survey monuments are quite common on properties without boundary walls, which are often later subsumed into walls. Stone cairns are a common subtype in parks and other public lands, and are often used to mark a trail. Aside from context, they may be indistinguishable. Some historic cairns indicate the growth of hiking as a hobby in the 20th century, punctuated by the CCC (Civilian Conservation Corps) movement, and the creation or outdoor clubs such as the Appalachian Mountain Club. Related to cairns are stone statues, a fast-emerging form of folk art in which stones are placed in such a way as to resemble stick-figures. Most enigmatic are stone boxes, which would be considered chambers if they were hollow; often they are nothing more than masses of stone arranged in a cubic or rectangular shape too short to qualify as a wall. Some of these I have seen in old cemeteries near exhumed graves, the rocks merely piled in a tight cubic shape. Another highly variable type of stone concentration is the stone pillar. Cylindrical or square, pillars are related to foundation walls because they were carefully built to support something from below, for example the central beams of large structures such as barns. Most are tumbled down because their stability derived from the weight of the building they formerly supported. The most primitive pillar is little more than two stones stacked one upon another. Railroad trestles are much more sophisticated versions of the same thing. This stone pillar (Type) is one type of stone upright (family), which lies within the Class “concentration.” Pillar from an old railroad bridge in southern VT. This is a specialized type of upright, usually found in association with cellar holes or building foundations, or of kilns and forges. Though normally collapsed, they are diagnosed by the presence of the smoke flue, a square chamber that once conducted the exhaust. The rocks often retain some of the soot, and reddened scorched zones. 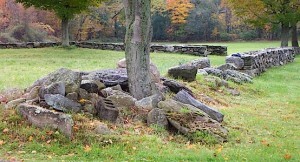 Increasingly common in the parks of New England are benches built with a span of stone (usually with a blade shape) resting on one or more stones to either side. Another version of this physics involves two standing stones with a lintel placed across them. Other spans are clearly decorative, or symbolic. Though not generally important to New England stone history, I include them here because this taxonomy must be inclusive of everything within its domain, and these are easily recognized. Hence, this taxon. In my experience, an equal number are made of quarried stone and field stone. 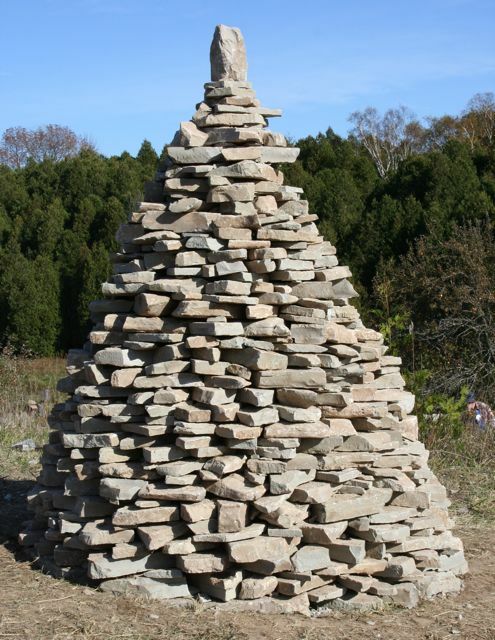 A generic freestanding (Type) stone pile is arguably the most familar and common example of stone concentration (Class). Were this pile narrower, it would qualify as a wall of the type known as a stone band. 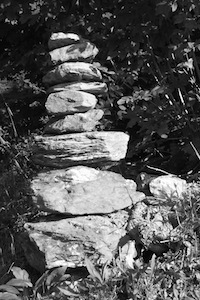 Stone piles are an extremely important component of the Stone Domain, perhaps equal to the common single walls in terms of frequency on the landscape. This large family of stone concentrations grades into several other taxa, separated by only arbitrary distinctions. Regardless of internal order, they grade into stone bands (the most primitive types of freestanding walls) when they fall short of the 4:1 length/width ratio. They grade into uprights when the stone is stacked, rather than merely dumped. 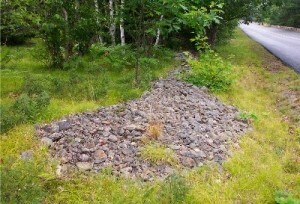 Fundamentally, a stone pile is a disordered granular solid. It’s particles are made of stone, and its cross-sectional shape is broadly conical or mounded, almost always with a rounded summit (due to diffusive processes). Sometimes the direction in which the stone was were off-loaded can be inferred from the shape and assymetry of the pile, or by the fraction of large vs. small stones (the small can be tossed further). Hence, if there is a change from large to small stones across the pile, the side with the small stones is usually the one that was furthest away. This situation is reversed for piles on slopes because the large stones have the greatest momentum. This type of pile is not connected to either a stone wall (attached type) or to a boulder or rock slab (surmounting type). I distinguish three basic types. Subtype: Mound – The subtype mound is the default pile: a disordered heap that rises above grade. They are especially common in areas farmed for just a generation or less. In detail, the shapes are highly variable, being tear-drop shaped in plan, or asymmetric in longitudinal section. Particularly large diameter piles are often flat at the top, or may have raised rims consisting of stones that couldn’t be pitched further in from the edge. An unusual variant of the Mound Subtype is the Native American burial mound. These are usually elongate, with the central stones collapsed downward giving rise to an imbricate pattern that suggests loss of support due to decomposition of the body. Subtype: Infill – An infill pile is a subtype associated with a patch of “low ground” that was filled with stone rubble, often to help to bring it up to grade or to provide surface to cross a small stream on. These are common in swamps and across marshy streams where they grade into primitive causeways (Raising Walls). Subtype: Ring – Though like the Mound Subtype of pile in being circular, these have a much lower concentration of stones in the center. There are several common variants. Not the best example, but it works. A pile mounded around a tree will form a ring pile (Type) when the tree dies and the stump rots. This is also the case when a tree spouts in a pile, grows, and then dies. This pushes the stone outward. Variant: Tree Ring – A tree ring pile is fairly common, though it often goes undetected because they are so low to the ground. On primitive farmsteads, the largest stumps, especially of sprouting trees like chestnut, were often left because they weren’t worth the trouble of grubbing out. They became sites where refuse stone accumulated, initially around them, but over time, above them as well. When the stumps finally rotted, the pile of stones developed a low, often stone free center, resembling a large donut. 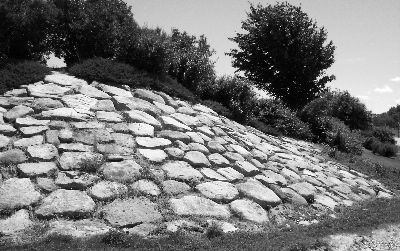 Though the largest of these could qualify as ring walls (because the stones rest above one another, most are properly classified as piles (albeit with hollow centers). Variant: Campfire Ring – Many campfires are banked by rows or low stacks stones, which would easily qualify them as stone rows or stone walls if they were larger. Most are collapsed into a ring-shaped low pile of stones. Many campfire rings have since been abandoned, and occur either as archaeological sites, whether as encampments for militia, or solitary fires for prehistoric activity. Variant: Stone Rosette – Related to a tree ring, but at a much smaller scale, is a stone rosette. These developed not around trees, but around fence posts, which often benefited from the few stones leaned up against it. Most such stones came form the hole holding the post, so there was no hauling involved. The hollow center of a stone rosette is scarcely detectable, but the stones are still there, arranged as if petals on a flower, radiating out from what used to be the base of a fencepost. This pile is attached to the end of a low wall in Acadia National Park, ME. The attachment must be to a stone wall, not to another pile. Subtype: Flanking Pile – Similar deposits can also be present anywhere along a wall as the subtype of flanking pile. In some places, flanking piles grow high enough to spill over the old wall, often burying it completely. This usually indicates the need to dispose of stone without concern for losing space. Subtype: Topping Pile -The subtype topping pile lie directly on double or broad walls. With the space pre-empted already, the top of a double wall is an ideal place to dispose of more stone. The presence of attached piles, especially flanking and topping piles, proclaims that stone disposal was much more important than aesthetic considerations. This type occurs where the pile of stone is associated neither with a wall or the ground, but on a notable slab of rock that apparently was too large to move. It signifies a greater interest in stone clearing than in wall building; otherwise the stone would have been used as a resource. Surmounting piles grow until they submerge the slab, at which point they will be mistaken for free-standing piles. The significance of this is to explain why an otherwise impeccably cleared field has a pile in the middle of it.